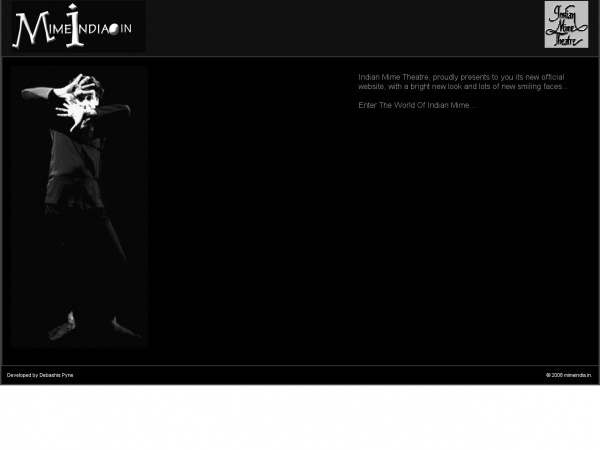 “Indian Mime Theatre has crossed a long and active thrity two years. Since its inception in 1976, IMT has experienced lots of successes and failures at times; it has faced many ups and downs; accepted appreciation and criticism with equal sincerity; confronted challenges and received cooperation with similar modesty. Indian Mime Theatre has been working tirelessly for the development and promotion of Mukabhinaya (i.e.. Silent Acting – the Indian version of Pantomime). Mukabhinaya, through the persistent effort of Indian Mime Theatre, has been able to achieve the status of a separate indigenous art form from the Government of India. Mukabhinaya as apart from European mime has elements of classical Indian dances in it. The eminent pantomime artist of India Mr. Niranjan Goswami founded Indian Mime Theatre. IMT has since done lot of experimentation with this art form. The new form emerged was based on Natyashastra and hence is absolutely Indian. The training method that is developed by Mr. Goswami is also different. The movement, gesture or posture of Indian Mukabhinaya is more intricate and subtle. IMT has been producing both theme and story based short items and full-fledged mime-plays since its inception in 1976.